WhatsApp for iPhone has received its first update for this year and with it comes the ability to send multiple photos at once and iCloud back up! 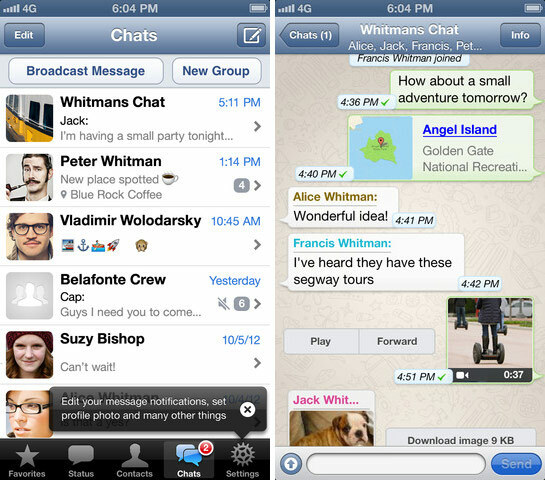 Today we released a new version of WhatsApp for iPhone. This is our first update this year and it brings a few major changes we’re excited to tell you about. Along with this update, they are also introducing the pricing model which is made simple for all platforms. We’ve simplified our business model so that all users on all platforms will enjoy their first year of WhatsApp service for free, and only pay $.99 per year after that. We feel that this model will allow us to become the communications service of the 21st century, and provide you the best way to stay in touch with your friends and family with no ads getting in the way. The good news for all current iPhone users is that WhatsApp will be free of charge for the rest of your life. You can get the WhatsApp update from the AppStore now.